This year, skip the tie and give Dad the gift of DIY. 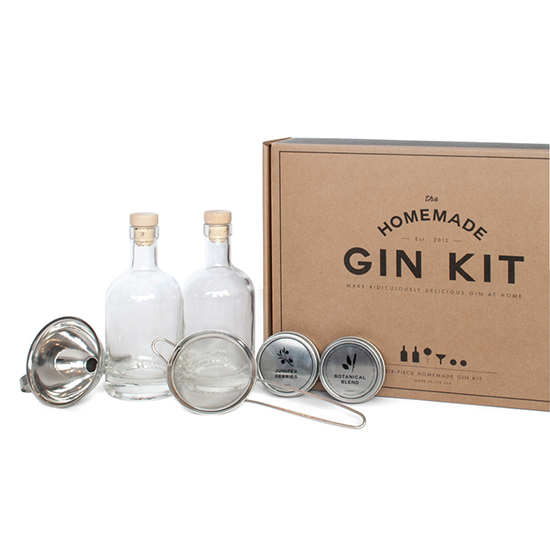 Here, eight fun food- and booze-centric kits that make perfect Father’s Day presents. No, this kit does not give you tools to turn a bathtub into a still (which is super-illegal, just FYI). Instead, it’s filled with everything you need to transform a basic bottle of vodka (supply your own) into a delicious, aromatic gin. $49.95; birchbox.com. Williams-Sonoma’s simple kit supplies sausage lovers with the gear and spices to make three different varieties: breakfast, Italian and chorizo. The only thing you need to buy separately is the meat. $49.95; williams-sonoma.com. Kickstart Dad’s cheese cave with this incredible kit from Urban Cheesecraft. It contains all of the ingredients (save for the milk) and equipment for five different types of cheeses: mozzarella, ricotta, goat, paneer and queso blanco. $50; etsy.com. Hella Bitters’s kit is stocked with the tools required to make both aromatic and citrus bitters at home. It’s a great starter set for budding bartenders, but it’s also a good gift for adventurous dads who want to start simple and then branch out with their own flavor innovations. $64.95; hellabitters.com. Give a dad some bacon, and he’ll eat for a weekend. But teach a dad to make bacon, and you’ll revolutionize the way he thinks about breakfast. The Original Baconkit includes everything except the pork belly. $22.99; baconkit.com. Supplement Dad’s Sriracha addiction with this kit, which includes enough ingredients and equipment to make 12 bottles of six different kinds of hot sauce. $49.95; growandmake.com. Brooklyn Brew Shop put together the perfect kit for dads who want to enter into the exciting world of homebrewing. In it you’ll find everything you need to make a terrific IPA, a capper set and a beer bottle set. $75; brooklynbrewshop.com. Beer isn’t the only thing you can brew at home. Both sweet sarsaparilla and spicy ginger beer are super-easy to make, especially with this straightforward DIY kit. $50; food52.com.